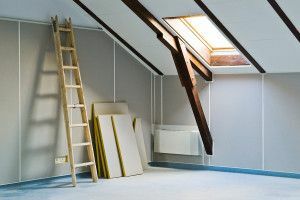 If you’re considering converting your attic into a usable space, the attic finishing services provided by MR. FIX-IT™ for homeowners in Richmond, Virginia, may be just what you need. Whether you’re looking for a comfortable, loft-style bedroom, a home theater were you can watch movies with friends and family, or a game room for hanging your with buddies, our attic finishing staff has the expertise required to make your wishes a reality. Our expert designers will meet with you personally and visit your home to look at your present attic, enabling them to precisely gauge what will be necessary to remodel the space. Our design staff will also listen attentively to your every request, incorporating your wishes into an attic design plan. Once you’ve had a chance to look the plan over and give final approval, the attic finishing process can begin. Once we get started renovating your attic, our team’s first priority will be to ensure that it is properly insulated, wired, and ventilated, both for your comfort and safety. Any components that are not up to code will be quickly replaced, and once that is complete, we will begin installing the systems and features necessary to transform your attic into whatever you desire. Best of all, you can place complete faith in the skills of our attic finishing craftsmen and contractors, whose work has helped us earn and retain an A+ rating with the Better Business Bureau. To learn more about the attic finishing services that we offer in Richmond, VA, and all surrounding communities, contact MR. FIX-IT™ today.